I don’t drink caffeine during the day. I have a hard enough time sleeping as it is that caffeine after my morning coffee would wire me for too long! That being said, there are some days when I change my mind and have a cup of coffee. Today it seemed that the “Pumpkin Spice Latte” talk was all around me. I was focused on working on the third cookbook and found myself a little sleepy, so I decided, “Hmmm... maybe I’ll just make one.” I had espresso, soymilk, pumpkin pie spice and heavy cream on hand. There was no reason not to make it, so here’s what I came up with today. Easy and inexpensive - you can make this at home! First, I got out the espresso. 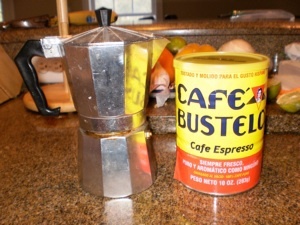 (#1) Because we like to make Cafe Cubano anytime we need a little “kick,” I keep this particular espresso, Café Bustelo on hand, simply because that’s what my Cuban friends use. I packed my little espresso maker with espresso (#2), and filled the water up to the steam part on the bottom (#3). (#s indicate order ofpictures below). 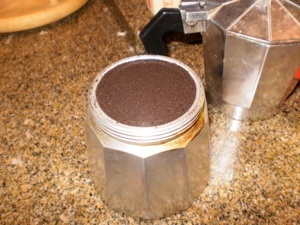 Next, you place this on the stove top and cook with the lid off until you see the espresso brewing. (#4) (When making Cafe Cubano, this is when I add that beginning mixture to sugar to stir) Close lid and continue brewing. (#5) Meanwhile, heat 1 cup of vanilla soymilk. (You can heat this in a saucepan or in the microwave). 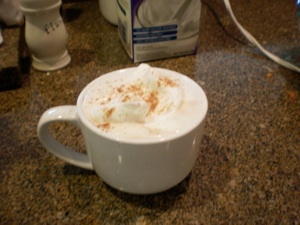 Add warmed soymilk to the blender, along with 1 teaspoon of pumpkin pie spice (and if you need it, sugar. I did not add sugar because my Silk Vanilla Soymilk is sweet, so this was a personal preference for me). (#6 and #7) When you add a warm beverage to the blender, remember to keep your hand on top, so the lid doesn’t fly off, sending warm liquid everywhere!